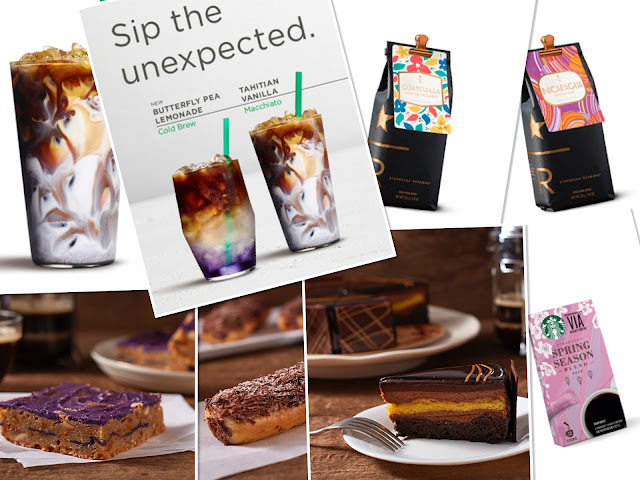 The most photogenic Starbucks drinks are about to hit stores on Feb 20th. In time for Spring, Starbucks Philippines serves up a striking, color-changing beverage that will surely invade your IG feed. The Butterfly Pea Lemonade Cold Brew is a refreshing thirst-quencher that combines the butterfly pea flower tea, a popular ingredient in Southeast Asian cuisine renowned for its natural blue hue and mesmerizing color changing properties, with tangy lemonade and the deep notes of Starbucks Cold Brew. The Tahitian Vanilla Macchiato is also returning for a limited time. This favorite beverage is coffee-forward, combining Tahitian Vanilla syrup and velvety steamed milk, topped with Starbucks Signature Espresso, vanilla bean specks and drizzle of vanilla syrup. Also a must-try are these new food items: Mango Purple Yam Bar, a chewy butterscotch bar with mango bits and purple yam; the Chocolate Doughnut Eclair filled with luscious cream and milk chocolate; Midnight Dream Cake, a moist and chewy fudge brownie, light vanilla sponge cake, crunchy hazelnut paste and velvety milk chocolate mousse finished with dark chocolate glaze. Meanwhile, the Starbucks Spring Season Blend will be available in whole bean, Starbucks VIA and Origami. For Starbucks card and merchandise collectors, there will be a Spring Siren design and 4 designs of the Easter Egg card that will be released on Feb 20th and Mar 15th respectively. The Cherry Blossom Collection, to be launched on Feb 20th will include limited edition mugs, tumblers, water bottles and other merchandise in two design themes - a lovely pink petal design against the midnight backdrop and petal-inspired embellishments in a blushing pink blossom theme.